On almost every continent, countries are looking to home equity extraction methodologies to help fund aging and retirement, each with their own quirks. 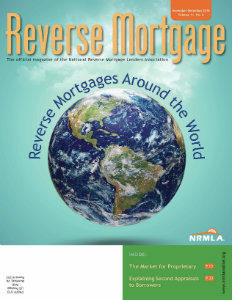 In our cover story for the November-December issue of Reverse Mortgage magazine, we sent staff writer Mark Olshaker on a virtual world tour to search for the best ideas from abroad. Like all policy changes, the new appraisal rules implemented by the FHA for the FY 2019 budget have triggered a good deal of industry chit-chat. But now we have to go out and explain the possibility of a second appraisal to potential borrowers. How are we going to do that? For advice, we turned to Dan Hultquist of Live Well Financial, a CRMP and the author of Understanding Reverse Mortgages. And finally, we introduce you to Eddie Seiler, PhD, Fulbright scholar, former director of Economics at Fannie Mae, and now the vice president, Research and Economic Analysis at Dworbell, Inc., the umbrella association management company for NRMLA, who analyses the growing dependence on debt by older adults of varying ages and wealth.